What Soosai vs UOI judgment says: Castes of Hindu religion identified on ‘untouchability’ related parameters were already scheduled under the 1936 Order. The validity of the order was considered by the Supreme Court in Writ Petition No. 9596/83 in the case of Soosai Vs The Union of India and Others (AIR 1986 SC 733). In para 7 of the judgment the Court had observed that “Now it cannot be disputed that the Caste system is a feature of the Hindu social structure. It is a social phenomenon peculiar to Hindu society. The Apex Court in para 8 of the judgment thus, observed that, “it is therefore, not possible to say that President acted arbitrarily in the exercise of his judgment in enacting paragraph 3 of the Constitution (Scheduled Castes) Order, 1950.” This is also sustained by the debate in Constituent Assembly which recognised “That the Scheduled Castes were a backward section of the society who were handicapped by the practice of untouchability” and that “This evil practice of untouchability was not recognised by any other religion” i.e. other than Hindu. It is apparent that the Constitution (SC) Order, 1950 relates to castes of Hindu religion. It only relates to the Castes discriminated within the Hindu religious system. The Constitution (SC) Order, 1950 is thus not discriminatory or violative of Articles 14, 15, 16 & 25 of the Constitution nor is it ultra vires of the Constitution as it provides for a special category i.e. the Scheduled Castes who have been given a special status under the Constitution. The Constitution (SC) Order, 1950 is thus neither unconstitutional nor ultra-vires of the Constitution nor it is violative of any fundamental right guaranteed by the Constitution. Here, the Christians never appealed or filed any revision petition against this order, but kept quite. At Vatican level, they had many issues and problems, as the Bishops and Cardinals have been following race or caste hierarchical structure. So far, no Black has been elected for the post of Pope, in spite of their claims. Christianity, caste and untouchability : Christianity, caste and untouchability: In spite of the tall claims made by the Christians, the caste, racism, untouchability and other factors have been there in Christianity. The hundreds of denominations in different countries based on theology, practices, tribes etc., are the direct proof. Pope Gregory XV published a bull sanctioning caste regulations in the Christian Churches of India. Even the U. N. Commission of Inquiry (1953) into the racial situation in South Africa reported the Biblical background of inspiration for them to adopt “Apartheid” or “Christian caste system” with untouchability [Genesis. 9.25, Joshua. 9.21, 23 & 27]. Untouchability also finds its way to Bible [Joshua. 9.19]. In Ireland, there are separate streets for Roman Catholics and Protestants, as each group treatsothers “untouchables”. Slavery has been a divine approved system [Levi. 25: 44-46; Timothy. 6.11]. Prasadam offered to Jehovah should not be eaten by others [Exo.12:43]. They should not touch things holy to him or offer sacrifice [Levi. 22:25]. Bible should not be taught to others [Jewish Encyclopedia, Vol. 5, p.623; Exo.27:33]. They cannot offer incense [Numbers.16: 40]. They should not approach the holy tabernacle i.e, the “Garba Griha” / Sanctum Sanctorum [Numbers 1.51]. The dishonest Christians suppress everything and try to fool the gullible SCs and STs projecting that their religion saves them. they could not save their own souls of SCs /STs with dubious methods. There are A to Z Churches with denominations (castes) running into more than 3000 depending upon the nation, language, ethnicity, culture, civilization and other factors. The matrimonial columns appearing in the newspapers and periodicals expose their hypocrisy, as the bride / groom are hunted only on the basis of “caste” and not on the “Christ”! Crores of Rupees flow into India from abroad to convert India to Christianity. World Christian Organizations never hide this plan. After the Neogi Commission Report, they have only changed their tactics in routing the money. Political pressure at national and international levels is applied through different channels to pump money in. only 30-40% is actually spent under the guise of charity, service, and liberation etc., whereas, 60-70% is adjusted in their manipulated accounts duly certified. They have formed their own high castes and they do not want to share profits with the new converts. They treat them just as “natives” counting numbers and sending statistical figures to parent organizations. Theologies floated to suppress the facts: Thus, the discrimination persists and percolates to bottom reaching new complications and crating new social tensions. Therefore, to divert the issue, as decided by the World Council of Churches and other organizations, they set up different “research groups” to shift the blame to Hinduism and escape. After politicizing, they have tried to internationalize the issue. Whoever Indian writer, journalist or “scholar”, who supports this theory, is received aboard usually USA or Germany and taken care of. “Dalit Theology” is the superior theology masqueraded in mere theoretical egalitarianism to fool “Dalits” projecting Jesus as the Super Star Saviour and Christianity to solve all their social problems, suppressing all cold facts, historical truths and the past tract record of Christianity. “Liberation Theology” is nothing but “Christian Communism” with God offered in different garb mainly advocating violence. It advocates violence, terrorism and anti-national activities in a country where it is preached. After the death of Communism and exposure of their deadly acts in Latin American countries, they have turned their attention to “Dalit Theology”. Pope Gregory XV issued a Bull authorizing Caste: The Pope and the Church have been playing dual roles as for as India is concerned. Definitely, what the Pope said and what has been reported by Associated Press differs, as AP has tried to interpret the Pope, as if he has recommended that “Christians must reject divisions based on caste” (The Hindu Nov.18, p.12). The Pope Gregory XV (1621-23) has definitely accepted the caste. The Bull of Pope Gregory XV, “Bulla Romanae Sedis Antistitis”, dated 31 January 1623, accedes to the requests of the missionaries to accommodate themselves to certain caste practices and usages of the new converts. Why not then the present Pope annul the Papal Bull issued, instead of recollecting what he had said in 1986. In fact, after his visit, there had been so many “caste problems and issues” within the Indian Church. The “Dalit Christian problem” arose phenomenally. The Supreme Court itself pronounced that if the Church wants reservation based on untouchability and caste, such factors of existence in Christianity should be proven (Soosai vs UOI – AIR 1986). Then, started the >research of Athony Raj, SJ with funds to prove that untouchability and Caste system were there in Christianity and practiced even today. 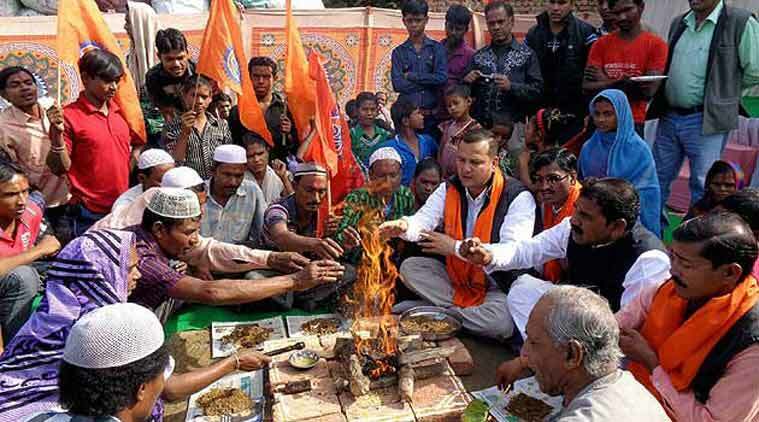 Whether Muslims can get SC status by converting back to Hindu religion? : A Muslim from audience asked, “I wanted to convert back to Hindu religion and whether I could get SC status, as the Supreme Court pronounced in some cases, that a converted SC-Christian could get back, SC-status, when their SC members accepted him back as his member again. In the same way, if a SC-Muslim wanted to convert back to Hindu religion, whether he could get back SC-status”. Actually, these cases pertain to election candidates, where Christians converts contested elections at reserved constituencies, claiming that they were SCs. When, this was challenged at the courts, the Christians got certificates to the effect that they were Hindu SCs. So the courts pronounced that, as candidate converted back to Hindu religion and got a certificate, documentary evidence to that effect, he was considered as “Hindu”. It is not known as to how the present-day Muslims, who want to claim back their SC-status by converting back, would prove their caste identity. Ironically, most of them or some of them would also claim that they were not the converted categories from India, but, directly descended from the forefathers, who were of Arabic tribal origins [Ansaris, Mujahideen, and others]. If they were really interested in converting back, why then criticize “Gharwapasi”? Origin of Caste – the Chairman spoke and wound up the session: The second paper was presented by Bhup Singh Gaur on the approach of Harijans / SCs by Gandhi and Ambedkar. He interpreted that both leaders worked for the upliftment and welfare of the people in their own way. He pointed out that Amedkar was the only leader who attended all the three RTCs and consistently fighting for the rights of Depressed Castes. The third paper, “Dalit – A legal Perspective” was presented by S. Balakrishna Hedge. His paper was almost answering the issue raised by Tanweer Fazal. Finally, the chair of Prof Chandrama Kanagali presented her paper about the origin of caste in India. She pointed out that the origins of the term ‘caste’ are attributed to the Spanish and Portuguese casta, which, according to the John Minsheu‘s Spanish dictionary (1599), means “race, lineage, or breed”. When the Spanish colonized the New World, they used the word to mean a “clan or lineage.” However, it was the Portuguese who employed casta in the primary modern sense when they applied it to the thousands of endogamous, hereditary Indian social groups they encountered upon their arrival in India in 1498. The use of the spelling “caste,” with this latter meaning, is first attested to in English in 1613. The word “Dalit” is neither constitutional nor legal: The National Commission for Scheduled Castes has asked the state governments not to use the word ‘Dalit” in official documents, saying the term was “unconstitutional”. The commission has stated that sometimes the word ‘Dalit” is used as a substitute for Scheduled Caste in official documents, sources in State Tribal Department said in Raipur. After consultation with the legal department, the commission said the ‘Dalit” word is neither constitutional nor the word has been mentioned in the current laws. Rather ‘Scheduled Caste” is the appropriate and notified word as per the Article 341 of the Constitution, it said in a letter sent to all states. The writers and researchers do not care even about this and continue to mention the word for ulterior motive.